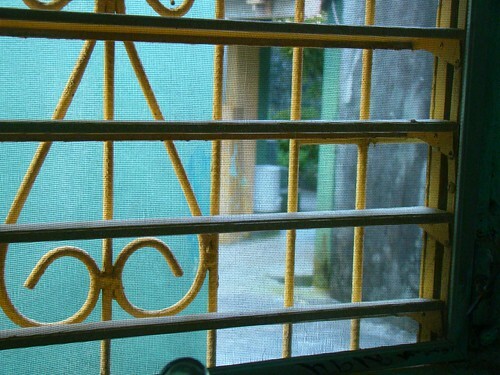 My Work Window, originally uploaded by Peder with a D.
Today is what I would call my first regular "office day" since my arrival here in Belize. I got up this morning, came to work and just knocked items off my To Do list all day. 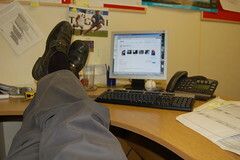 Nothing to memorable … except that's it's my first regular old boring office day in six months! It feels good to be working again. Far from every day will be memorable, so I might as well write down what I've done today. I wrote a blog post about our advocacy work, and responded to positive blog comments by our UNDP financier and one of the local political parties. I ate a decent chicken burrito at the snack stand just around the corner from the office. And I've spent the afternoon chronicling potential funders for future project proposals. I woke up early this morning. Of course, 6am isn’t that early around here. By that time the roosters have started crowing and you’ll hear the first rustlings of life as families wake to feed their kids and send them off to school. But compared to when I was waking up just one short month ago, this is early. I had to wait until ~7:30 until the shop next door opened. I was out of milk for my cereal. Last night I knew I was out of milk but I didn’t do anything about it. After a day in the field, with one of our target communities at Medina Bank, I was bushwhacked. A cold beer, a colder shower and I was in bed before prime time television was over in the States. But when I got to the shop, the didn’t have “regular” milk. They had condensed and powdered milk, but nothing that I wanted to put on my Corn Flakes. Oh, that was another thing, I was sick of eating Corn Flakes so I was thinking of splurging on some Honey Bunches of Oats. Simple pleasures down here my friends, simple pleasures. But the shop didn’t have that either. Boo. Fortunately, today is market day in Punta Gorda. Mayans travel over land from the villages and Guatemalans travel over water from the distant coast to sell their wares. Vegetables dominate the market, and you’ll find a wide array of fruits, beans, nuts and other confectionary items. Not too different from markets the world over. Oh, and the fishermen were bringing in their morning’s catch. Fishmongers can be very aggressive salesmen, but at 8:00 in the morning, it wasn’t hard to say “no” to raw fish. Anyway, after a brief walkabout checking on the various goods, I settled on fresh papaya and a bunch of bananas for breakfast. 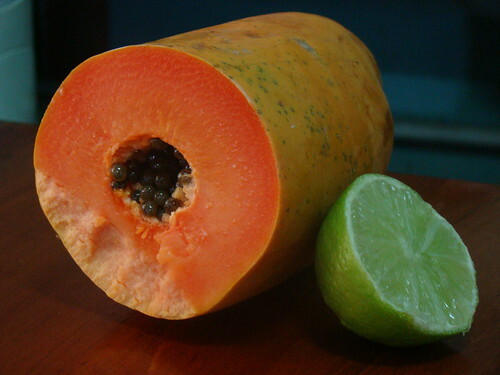 The papaya is almost gone as I write this, and the bananas will be shared around the office. Not a bad deal for $1.00. So it’s been a while since I’ve updated here. That’s mostly because writing on this blog requires a constant Internet connection, which I don’t always have down here in Punta Gorda. The exception would be at work, but it’s a little hard to find time for my personal blog when I’m there. The other reason is because I’ve been updating to a new blog toy that I have. It allows me to make a post simply by sending an email, which is a lot easier to do whilst at work. I’ve put a few updates there from Belize. 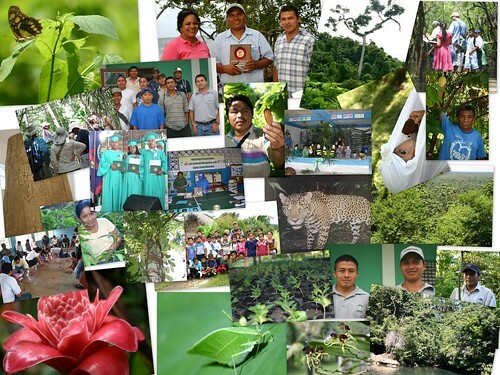 I talked about my first days in country, and I purged some pics of jaguars, red-eyed tree frogs and Mayan handicrafts from my office hard drive. They’re such cool pics I had to share. I’ve also taken a bunch of pictures which I posted to Flickr. Work so far is good. I’ve spent some time writing up project concept sheets – the first step in getting a funding grant – and I’ve set up some online spaces for future broadcast use. We have a new work blog, we’re updating our website, and we have our own Flickr and Twitter accounts. Life down here is very different from in the States. I don’t have a warm shower, but I can swim in the ocean whenever I want. I don’t have a car, but it’s easy to get around on bikes. It rains a lot, but it doesn’t snow. Things are a little dingy all over, but the people are really friendly and laid back. This first week has been quite the shock to the system – we’re not in Kansas anymore, Toto – but that’s to be expected. Sometimes I have to remind myself that just because I’ve moved overseas before doesn’t mean this is gonna be easy-peasy. There’s still an adjustment stage that I need to give myself. It’s OK to have culture shock. My house is good, it’s a little out of town (but still easily bikeable) in a “suburb” called Hopeville. I live at the intersection of Mangrove and Morning Glory Streets. It’s a quiet neighborhood where everyone seems to know everyone else. I like to sit out front after work and read my book waving at everybody so they get used to me being around. Sometimes I wear my hat too cuz it’s even more distinctive. The more people can remember you and even have a little laugh, the better off you are. And that hat is pretty memorable. (Some have said I look a bit like on of the local Mennonites, and that always gets a laugh. they’re a group that has seclude itself from everyone else in a little village a few miles away.) Not that not having problems would even be really possible. My landlord is from a well-known local family and his siblings and parents are scattered around in different houses in the neighborhood. He knows everyone, everyone knows him and when I say I’m living with Mr. Burton (that’s his first name, I’m Mr. Peder) I always get a positive response. I’ve come to really like how diverse Belize is. There are significant cultural differences among the Mestizo, Kriol, Garifuna, Chinese, Mayan, East Indian and Mennonite communities, but everyone gets along pretty well. Not from the news nor from talking to people have I heard of inter-racial issues. Add to that the influx of tourists and expats from all parts of the globe and you have a model society of people getting along. In a future post I’ll talk more about these ethnic groups, their divisions and their languages. I made this collage after work yesterday of a bunch of photos I found and liked in our organization's archive. I used Picasa 3 to do it, which is a cool little piece of software. Took these pics at the office yesterday. 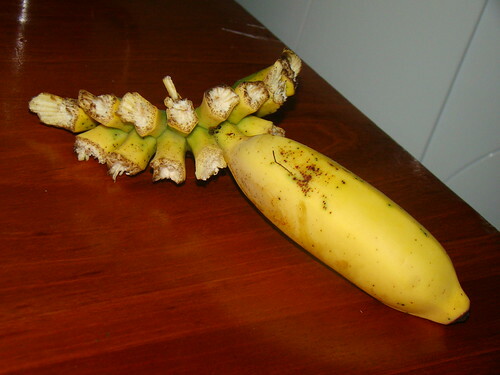 The mini bananas (not plantains) were delicious, as was the papaya. Didn't try the lime, but frozen lime juice has become one of my favorites since I've been here. 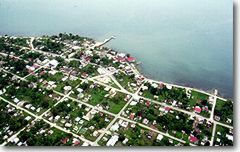 Punta Gorda, known locally as P.G., is the southernmost town in Belize and the capital of the Toledo District. The population is close to 6000 people, with a mixture of Mopan and Kekchi Maya, Garifuna, Creoles, Lebanese, East Indian and Chinese peoples. Almost 210 miles by road from Belize City, it is the last sizeable settlement in Southern Belize. The road into town follows the shoreline; five main streets run parallel inland. 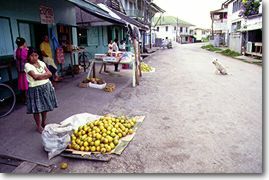 Various fruit trees, especially mango trees, line the streets. Most small homes are made of wood on stilts. The town has one hospital, a police station, one bank, a post office, a gas station, a civic center, a number of churches and schools, and various grocery stores, hotels, restaurants and bars. 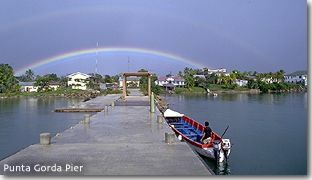 Punta Gorda is a gateway to and from Guatemala with immigration and customs office near the town dock. With it’s cool sea breezes and friendly people, Punta Gorda is a pleasant and interesting town. The pace of life is slow and easy-going. Traffic is minimal on the streets. People hang out on street corners chatting, while school children play chase in the school yards. The town springs to life on holidays and market days-Saturday and Wednesday mornings- when the villagers and Guatemalans from across the border pour in to buy and sell hand-crafted produce and simple household goods around the clock tower. The waterfront is great for long strolls, with light constant breezes blowing in from the Bay of Honduras. Nightlife is quiet, but there are a couple bars with pool tables and on certain nights Garifuna drummers perform for tourists (though on any given night, you can hear drumming as P.G. is considered a major center for the Garinagu people). You may run into P.G.’s own local band known as the “Coolie Rebels”, who play their own rendition of popular songs. Punta Gorda is a perfect base from which to explore the rest of southern Belize. Many tour guides work from the town and can help you choose from a wide range of full or half day activities including fishing, kayaking, river touring, and snorkeling. This blog may see a decrease in the number of posts it gets as I’ll now be employed and have slightly less Internet access. I’ll also have stuff posted to my other blog and Twitter – you can see the RSS feeds over to the right – and I think I may start using this space to write fewer but longer posts on broad topics. We’ll see. Text and pics blatantly copied from the PG page on SouthernBelize.com – I know it’s not cool to do, but I did it. Sorry. just like that bug in the rug. 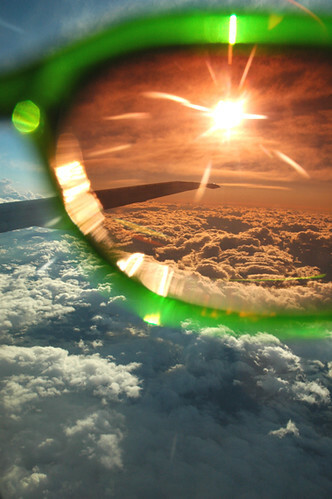 Sunglass, glass and sun, originally uploaded by daffie @ flickr.